Abdo al Hamuli is considered to be, along with Muhamad Othman, one of the two pillars of modernization as to the music of the renaissance period that was also called the Golden Age, rich in cultural and music production. 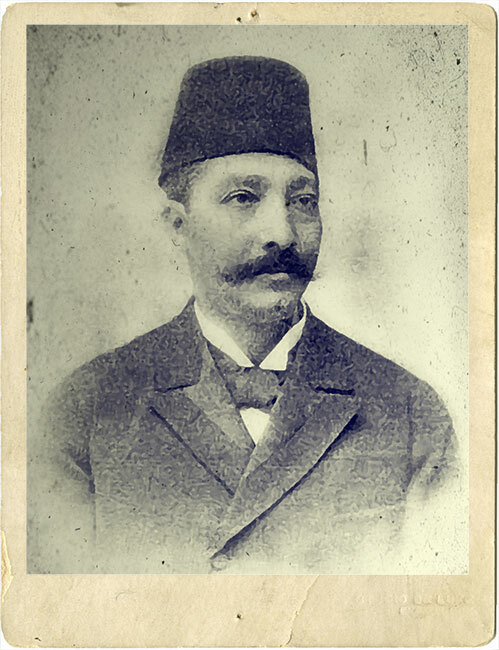 Abdo al Hamuli was born in 1841 (different sources give different dates, going form 1840 to 1845) in the city of Tanta. His father was a coffee trader who resented him because of the passion for singing he had since childhood. The disagreement between father and son forced Abdo and his older brother to flee the family home. They started roaming from farms to caves suffering from hunger and thirst and solitude until they stopped and settled in the town of Munia l-Qamh and met artist Prof. Shaaban who welcomed them very warmly. Shaaban discovered al-Hamuli’s talent and started teaching him the rules of singing then enrolled him in his band. Prof. Shaaban was a known singer and Qanun player who had taught artist Daoud Hosni and Singer Naima al Masriya. He took Abdo al Hamuli to Cairo and worked with him in the Othman Agha café, one of the many cafés in the forest that later became the Azbakiya Garden. In order to reinforce their relationship and keep a hold on al Hamuli, Shaaban married him to his daughter. But the ill-treatment and exploitation Shaaban used with al-Hamuli led Abdo to divorce from his daughter and to leave him and join his competitor Muhamad al Muqaddam (a singer famous in the mid 1800s and a follower of the Laythiya school. He had taught many singers the principles of singing, notably Muhamad Salem al Kabeer). Al-Hamuli soon left him because he too ill-treated him, and formed his own band that included major music professionals: Muhamad al ‘Aqqad (Qanun), Ahmad al Laythi (‘Ud), Ibrahim Sahlun (Violin), Ameen al-Bizri (Nay/flute), Muhamad Kamel al-Raqqaq (percussions). Ahmad Hassaneyn (a Mazhabgi). Numerous singers started their artistic carer as Mazhabgeya in his band, such as: Ahmad Hassaneyn, Abdel Hay Hilmi, Muhamad al Sab’, Muhamad al Baghdadi, Muhamad Nasr el Deen. Abdo started off singing in clubs and at weddings, and he turned to Muhamad Othman’s revisited melodies for his night concerts. He found in them a new springboard to use his voice and talent to a maximum. Khedive Ismaeel heard him and liked him. He brought him into his entourage and took him to Istanbul where he sang on numerous occasions in front of the Sultan. His mixing with the Turks and their music led him to create works that joined both the Egyptian and the Turkish styles: he introduced tunes unknown in Egypt, such as the Hijaz Kar key he authored his famous Adwar to: “Maleek el-Hassan Fi Dawlat Jamalih”, “Allah Yasoon Dawlat Husnak”, and “Kunt Feyn W el-Hubb Feyn”. Eyewitnesses and earwitnesses did not tire from describing the beauty of Abdo al Hamuli’s voice and the magic of his singing as well as his smart creative ability. He often took a Muhamad Othman composition and revisited it while performing it. He was known for his generosity and his sentimental creativity. Abdo al Hamuli cooperated with Ahmad Abu Khalil al Qabbani al Dimashqi in a compilation of plays the Qabbani band presented at the Opera House in January 1895. It was the first time an Arab singer stood on an opera stage. 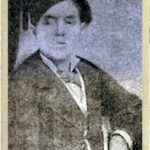 It later encouraged Sheikh Salama Higazi to overcome his hesitation and work in the theatre industry. Al Hamuli benefited a lot from his association with al Qabbani who was a capable composer and an expert in the secrets of Muwashahat and the science of keys and measures. Abdo married artist Almaz who had taken the lead as best singer, replacing artist Sakna ,one of the oldest learned singers at the time. He forced her to quit singing until she died in 1891. He elegized her in a Dawr starting with: “Shribt el-Sabr Min Ba’d el-Tasafi, w Marr el-Hal Ma ‘Riftish Asafi”. Abdo al Hamuli died on May 12th 1901. Poet Ahmad Shawqi elegized him in a poem starting with: “Saji’ el-Teyr Tar ‘An ‘Awkarih wa Tawalla Fann ‘Ala Atharih”.